Superbly bred mare Divanation recorded her second win at Geelong on Thursday, April 4. Divanation is by the stallion All Too Hard out of the triple Melbourne Cup winner Makybe Diva and is lightly raced building her record to two wins and two placings from just four starts. 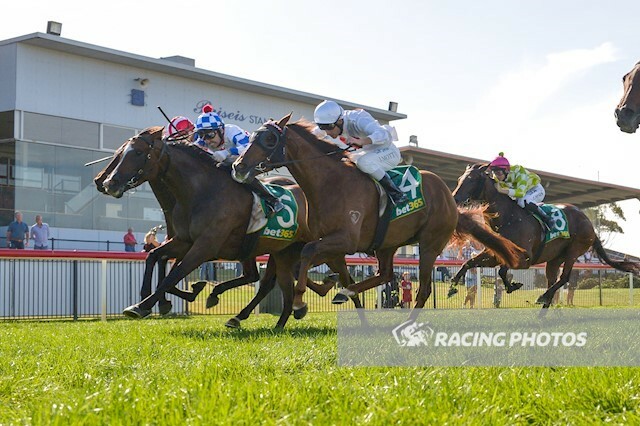 Ridden by Andrew Mallyon, the Tony McEvoy-trained mare left it late charging home to win the McGrath Estate Agents Benchmark 64 Handicap (1750m) at Geelong as a $2.10 favourite in a photo finish from Kenzee River ($31) with Ridgewood Drive ($7) a head away third in a thrilling finish. It was Divanation’s second run this preparation having been a first-up third over 1600m at Moonee Valley on March 15. Michael Shepherdson, Melbourne stable foreman wasn’t disappointed with the closeness of the finish. “The speed was just fair and they got up and around her going down the hill,” Shepherdson said. “Andrew just had to take his medicine and she was very determined late. “Tony would like to get her to a nice 2000 metre race in Adelaide during their autumn carnival for fillies and mares. Shepherdson said the mare had come on a lot mentally this preparation. “We’ve been real patient and taken our time and we are going to be rewarded. Winning jockey Andrew Mallyon was impressed by the win. “It was pretty willing early then the speed dropped out of the race,” Mallyon said. “I was going to be happy to land in a good spot but a few runners outside made her fire up a bit. “I elected to come out to get her to travel nice and smoothly and she dropped the bridle nicely. “Then the tempo dropped out but I was on the back of the right horse to bring me into the race. “She’s a mare that is going to stay and they way she settled today she is going the right way about it.